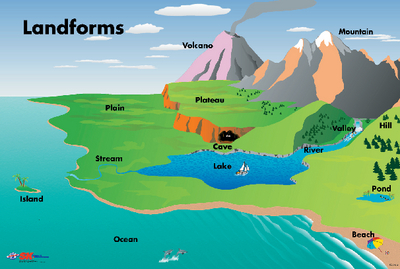 Home > Charts > Elementary Geography Terms Poster, TD/CT, 24 x 36"
Elementary Geography Terms Poster, TD/CT, 24 x 36"
Help students distinguish general geologic structures through visual recognition. This colorful poster is a welcome addition to any classroom where earth science is being taught. Playful pictures show beaches, oceans, valleys, mountains, volcanoes, islands, rivers, streams, and more in vivid representation. Large print letters label each landform and help students associate the images with the concepts.